At Nintendo’s press event held in the Nokia Center in Los Angeles, there were plenty of announcements, but only a handful of minor surprises. In general, Nintendo plans to continue doing exactly what has made it such a success- by appealing to families, and building on what works. The day at E3 began as we were ushered into the Nokia Center, just a few doors down from the LA Convention Center, where E3 is officially being held. Once people were seated, and the lights dimmed and Reggie Fils-Aime, President and COO of Nintendo America took the stage, and the event began. First, Fils-Aime covered the success of Nintendo, and dispelled rumors of Nintendo’s sales beginning to flatline. Nintendo still has the two best selling consoles in the Wii and the DS, and last December the Wii sold more consoles than any system ever in a one month period. The DS officially became the best selling system of all-time, so Nintendo is doing well, and the future continues to look bright. Once the talkingpoints had been established, the show really began. -First up was a look at a new Zelda game, Zelda: Skyward Sword. A new feature will build off of the Wii Motion Plus, and players will be able to use the Wii controllers as a sword and a shield. Shigeru Miyamoto, Senior Managing Director and creator of the Zelda franchise, explained the system before surprising the crowd and appearing on stage to show off the new controls. Problems with the connectivity of the controllers began, which caused a few chuckles, and a comment that we should all turn off our wifi (which was likely a joke at Steve Jobs’ expense). The problems slightly marred what looks to be an otherwise solid entry into the Zelda franchise. The game itself will allow players to swing the sword based on the motion of the controller, while defending with the other controller as a shield. The Wii nunchucks also will allow you to aim a bow and a slingshot, and one new feature is a beetle- which acts like a remote controlled helper that can fly off, pick up items, and scan the area ahead. The game is due out next year. -Next up, Fils-Aime returned to the stage and discussed the difference in sports games on the Wii versus other systems. On one hand, you have ultra-lifelike games that respond as players do, with characters that look like the real-life people. On the other hand, you have over-the-top-fun. This led into the next debut, Mario Sports Mix. Mario Sports Mix includes several game types such as volleyball, hockey, dodgeball, and basketball. All of which feature classic Nintendo characters, and all of which seem to carry over the tradition of games like Mario Kart. Fils-Aime also mentioned that a new NBA Jam was coming soon. -A new game called Wii Party was next, and it allows users to bring their Miis into the game, with 13 games and over 80 min games. -The video was followed by a trailer for Just Dance 2, the sequel to the dance based game. Just Dance 2 will feature 40 new tracks, new game types, and support 8 players. It is due out in Fall. -A sequel to the DS hit Golden Sun was confirmed, called Golden Sun: Dark Dawn. It is due out in time for the holidays. -The next announcement caught the attention of the audience and garnered what may have been the loudest applause of the show. Confirming rumors that have been circulating for quite awhile now, a new Goldeneye is coming in November, exclusively for the Wii. The game video showed a heavy emphasis on the multiplayer aspect (which is understandable), and Bond will be played in the game by Daniel Craig. -A new game from Disney was up next. Disney’s Epic Mickey is a platformer that is set in what was called the “wasteland”, and area where old and forgotten Disney characters and sets went. The game play looked to offer a few interesting tricks, including the ability to create new areas with paint, or to destroy them with thinner. How you treat the world around you directly effects how you are treated by others, and what kind of an ending to the game you will get. “Playstyle matters” was a theme hammered home during the demo. An interesting feature of the Mickey game is that to travel between areas, you pass through levels that are based on old Mickey cartoons. The example we saw was a black and white level based on Mickey’s first cartoon “Steamboat Willie”. -After seven years in the wilderness, a new Kirby game is on the way, Kirby’s Epic Yarn. The game looks interesting, as the graphics are all based on the concept of yarn. The characters, the background, even the colors look like fabric, which allows Kirby to manipulate them as such by knitting environments together. An interesting idea that has to be seen to appreciated. –Dragonquest 9, a port of the Japanese game will be released next month. Fils-Aime claims that one gamer has spent over 140 hours playing, and is “just getting started”. -Next came a new trailer for Metroid: Other M. We’ve been hearing a lot about this game recently, so the video was fairly straightforward and didn’t offer much in the terms of surprises. “Isolaiton and exploration are the trademarks of the franchise,” Fils-Aime said. -The next trailer was a bit of a surprise and definitely got the crowd applauding. Retro Studios, the team behind many of the recent Metroid games, has taken over the task of rebooting another Nintendo icon, Donkey Kong. Donkey Kong Country Returns comes out in time for the holidays. -Next up was the announcement that we had all been waiting for, the Nintendo 3DS. The 3DS was originally introduced at CES earlier this year, but E3 marked its real debut. Fils-Aime discussed the huge costs of upgrading to 3D, then highlighted that the 3DS uses a 3D screen, which doesn’t require glasses. 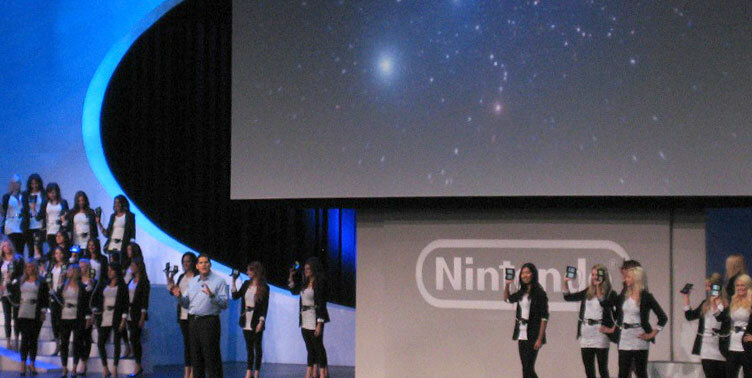 Nintendo President, Satoru Iwata, then took the stage and showed off the new portable game. It looks similar to the current DS, but it does have one surprising feature- perhaps the most surprising thing- on the back, it will feature two camera, which will allow users to take pictures in 3D. The 3DS will also allow owners to watch Hollywood movies in 3D. A list of movies is still under wraps, but WB, Dreamworks, and Disney are all on board to allow the 3DS to air their movies. One of the games announced for the 3DS as a launch title was the long awaited return of Kid Icarus in Kid Icarus: Uprising. Huge applause followed the news. Other 3DS titles mentioned included a new Metal Gear, a Resident Evil game, and Assassin’s Creed: Legacy, to name a few. The show ended with a short hands on demo of the 3DS, which featured a brief video that highlighted the potential of the hardware. It was brief, but promising. All-in-all, Nintendo’s event did not wow many people. The debuts were impressive, although not risky, but they did what they set out to do: remind people why they are still number one. Also check out Hands On with the Nintendo 3DS.